Granada has to be one of the most diverse and interesting provinces in Spain, where they boast that, at certain times the of the year, you can enjoy a ski on the snow and sun bathe or swim in the Mediterranean, all in the same day. Granada province was the last Moorish stronghold before they were driven out of Spain and they left behind plenty of interest. Granada city has fine Moorish buildings including the famous Alhambra and an impressive cathedral along with all the culture you would expect of a Spanish city. On the coast, the Costa Tropical, there are the resorts of Almunecar, Solobrena and Motril, all having a significant Moorish heritage. Inland from the Costa Tropical, on the southern slopes of the Sierra Nevada, are the Alpujarras, a truly unique part of Spain, showing a strong Moorish influence and diversity of plant life, due to being watered by the melting snow of the Sierra. The Alpujarras are popular with walkers due to the scenery and abundance of pathways. The Sierra Nevada themselves rise to 3,481m at the peak of Mulhacen - the highest in mainland Spain and together with being a location for skiing at Sol y Nieve, the sierra also form a large National Park with at least 66 plant species being native to the area. 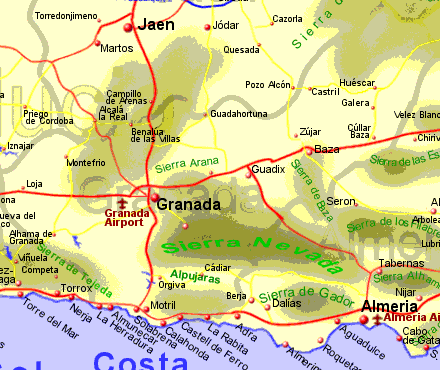 Other places of note in Granada province are Montefrio, to the west of Granada with it's Arab fortress, Alhama de Granada with it's spa and Arab fortress, Guadix, one of the oldest settlements in Spain with many cave dwellings carved in the rock on a plateau at 1000m between two sierras.